I just have to use the word fizzy to get my kids buzzing with excitement. They love any fizzy science activity that I share with them... especially if it is related to LEGO! This week is LEGO Week! We have been having fun sharing a LEGO themed activity every day. 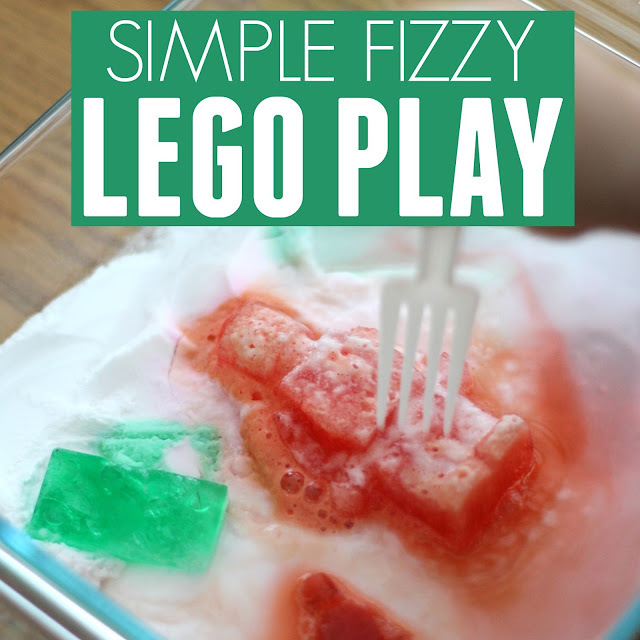 Today we used some LEGO molds to make some fizzy frozen LEGO play. Yesterday we shared an easy to make LEGO wall. To get started you need to make your frozen LEGO bricks and minifigures! 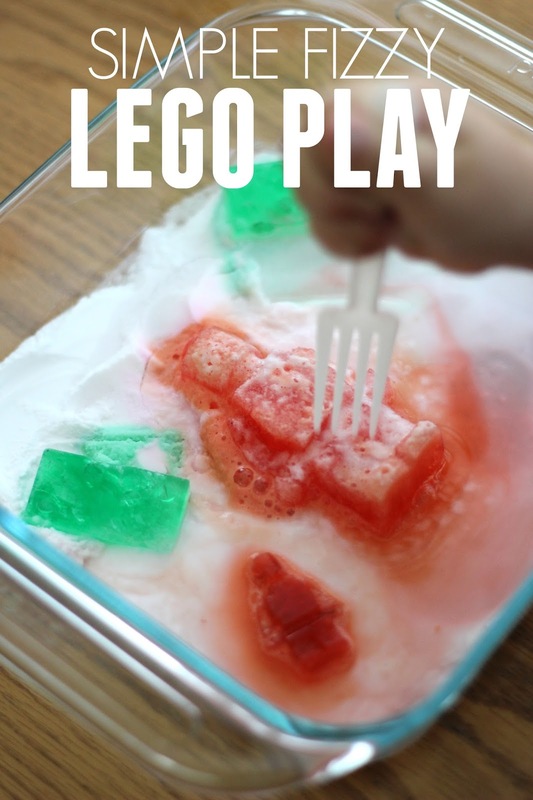 Mix vinegar with food coloring and then fill your LEGO molds. Next put the molds in the freezer overnight. Once the LEGO vinegar pieces are completely solid you are ready to play! 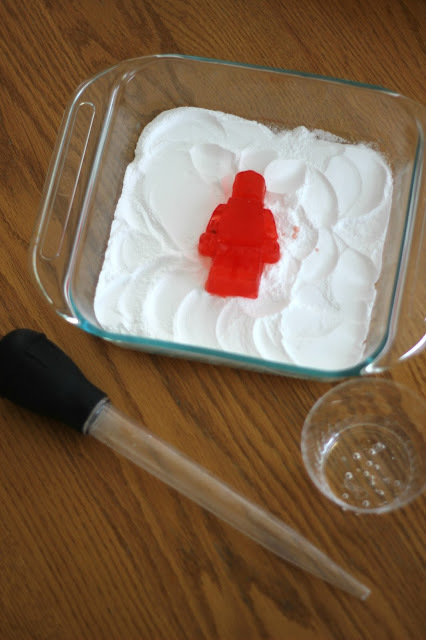 Fill up a pan with baking soda and then drop a frozen LEGO on top! Squirt a little water in to get the frozen LEGO melting and then watch what happens!! We surveyed the kids ahead of time to get their predictions about what would happen when we put the frozen vinegar on top of the baking soda. After we melted the frozen LEGO pieces a bit we added baking soda on top of the frozen pieces to see what would happen as well. We also talked about baking soda and what makes it fizz. Kids were SO CONFUSED because we were using frozen vinegar... which they thought was just frozen ice once it was frozen... so then they were very surprised when it fizzed. We talked about how to freeze things and how juice, vinegar, and water can all be frozen... and then when they melt they react differently. Next time I am going to make some frozen water LEGO bricks and some frozen vinegar LEGO bricks and let the kids explore them a bit as well and try and deduce which is which. 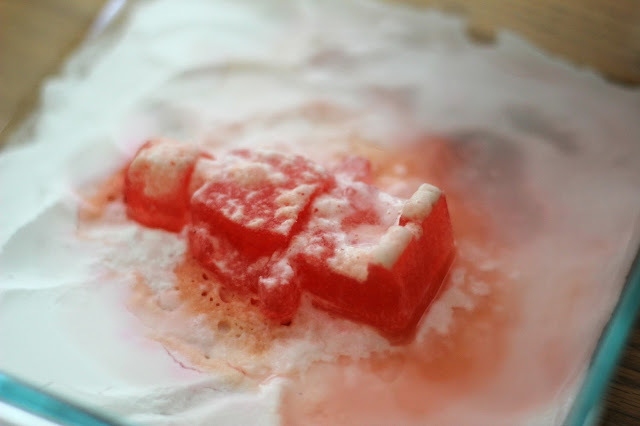 This is such a fun way to teach kids about liquids and solids and how vinegar and baking soda react. We used all of the frozen LEGO bricks we had trying this experiment again and again. The kids liked using different tools like plastic forks to break down the frozen LEGO pieces and help them melt faster... which then equalled more fizzing!! Have you ever made anything with LEGO molds before? Make sure you don't miss any of our LEGO Week activities! GO HERE to see all of the daily LEGO Week posts from our friends.